Pictured from left to right: Robin Merriman, Wichita Talent Acquisition; Karen Parr Schaeffer, Dallas Service Center HR; Karen McDougle, Tucson Service Center HR and Lee Boulanger, General Manager Hartford Service Center. Bombardier sees women as manufacturing’s largest pool of untapped talent. As part of its commitment to diversity and inclusion, and in support of our goal to increase the number of women in management positions, Bombardier continued its support of Women in Aviation, International (WAI) at its 26th Annual Conference held in Dallas, Texas. The aerospace industry still experiences difficulty in attracting and retaining women engineers, maintenance technicians and leaders. Bombardier sees women as manufacturing’s largest pool of untapped talent, underrepresented in all sectors except supporting functions. 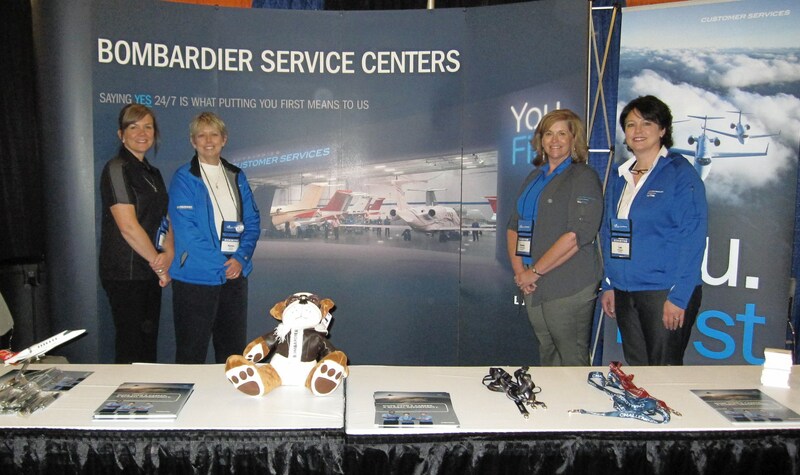 As part of its commitment to diversity and inclusion, and in support of our goal to increase the number of women in management positions, Bombardier continued its support of Women in Aviation, International (WAI) at its 26th Annual Conference which was recently held in Dallas, Texas. The conference fulfilled its promise to “Connect, Engage, Inspire” through an aviation job fair, professional development and educational sessions, a youth-outreach event, and the induction of four female aviation pioneers into the WAI Pioneer Hall of Fame. WAI is a nonprofit organization dedicated to providing networking, education, mentoring and scholarship opportunities for women (and men) who are striving for challenging and fulfilling careers in the aviation and aerospace industries. This year, Bombardier awarded three scholarships at the conference, two for maintenance training to WAI and to the Association for Women in Aviation Maintenance and one for pilot training. The maintenance training scholarships were awarded to two individuals who currently hold and A&P (Airframe and Powerplant) Certificate. The scholarships are for a Learjet 45 Maintenance Training course which is an 11-day course held at the Bombardier Aircraft Training Center (BAT) Center at DFW Airport in Dallas. The pilot training scholarship, awarded in memory of Learjet Instructor Pilot Richard E. Blose to Andrea Christina Eisele Iverson, offers a 16-day course for the Learjet 45 Type Rating which is also held at BAT-DFW. Upon successful completion of the training course, Ms. Iverson will be able to conduct a 100-percent type rating check ride in the Learjet 45 simulator. Congratulations to all of the recipients and we look forward to them joining our ranks in the future.